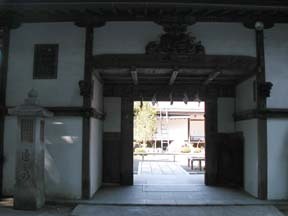 Temple Lodging in Japan "Hensyoson-in"
The baths are really the best, including a Japanese cypress bath that is said to be the largest on Mount Koya and an herb bath that can accommodate only two to three people. The herb bath is called the Darani Bath, and you can take this bath even if you are on a day trip. The restrooms are clean. The only shortcoming was the thin walls. They naturally serve shojin vegetarian cuisine. In the beginning, a young priest explains about the meal and Hannya-yu (They refer to sake in this way, while beer is called Mugi-Hannya. This might be the name of a sutra.) A group of guests from Shikoku became very excited and noisy. So I silently cheered up the priest who was trying to speak in a loud voice to make himself heard. The cooked rice tasted very good, so I asked for another bowl. 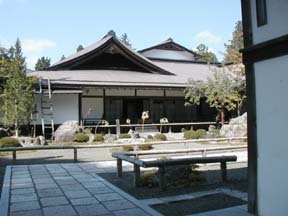 They worship Dainichi-Nyorai as the principal image. They have rooms and altars for shakyo (copying sutra by hand), ancestral tablets and mass for unborn babies. I participated in the morning service and listened to the sermon of the head priest, followed by osunafumi (stepping on sand). By stepping on the sand, you are supposed to worship at 188 sacred places, including the 88 places in Shikoku and the 100 Kannon sacred places in Saigoku, Bando and Chichibu. You can do this for free. As I was with people in a tour group, the Goma prayer took a long time and I became very hungry. There is a souvenir shop and a coffee shop in the shukubo building.